At their January 1996 meeting, the ARRL Board of Directors approved the recommendation of the Membership Services Committee to add Scarborough Reef (Huang Yan Dao) to the DXCC Countries List! For details, see ARRL DX Bulletin 5 and ARRL DX Bulletin 6. You are also invited to drop by the South China Sea DX Celebration Web Site for more information on Scarborough and other DX projects in the region. It was a long, hard fight! Even though Scarborough clearly meets both the letter of the modern DXCC rules and the original intent of the 1935 country criteria, there were several vocal opponents along the way who offered all manner of emotional arguments for ignoring these two facts. The question of Huang Yan Dao's DXCC Country status was first put to the DX Advisory Committee (DXAC). After considerable debate, the DXAC voted 9-7 AGAINST the addition of Huang Yan Dao to the List. The ARRL Awards Committee then reviewed the application and the supporting evidence, and votedUNANIMOUSLY IN FAVOR of adding Huang Yan Dao. With the chairmen of the two committees unable to effect a compromise, the matter then went to the Membership Services Committee (MSC), a standing committee of the ARRL Board of Directors. The MSC requested position papers and documentation from the two committees, and weighed the arguments from both sides. On 19 December 1995, they announced their decision to recommend the addition of Huang Yan Dao to the DXCC Countries List by a vote of 5-2. For the official announcement, see ARRL DX Bulletin 63. This recommendation then went before the full Board of Directors, which met in plenary session 19-20 January 1996. Scarborough Reef Slide Show On Line! The BS7H 1995 DXpedition slide show is on line! This is an abbreviated 24-slide version of the show which has been presented at DX conventions and hamfests from Visalia to Dayton to Beijing in recent months. Each slide is presented on its own page, with a brief narration below it. Your browser must be capable of supporting the JPG picture format. To step through the slides, use the arrows or links at the bottom of each page. So grab some popcorn, sit back, and let the show begin! 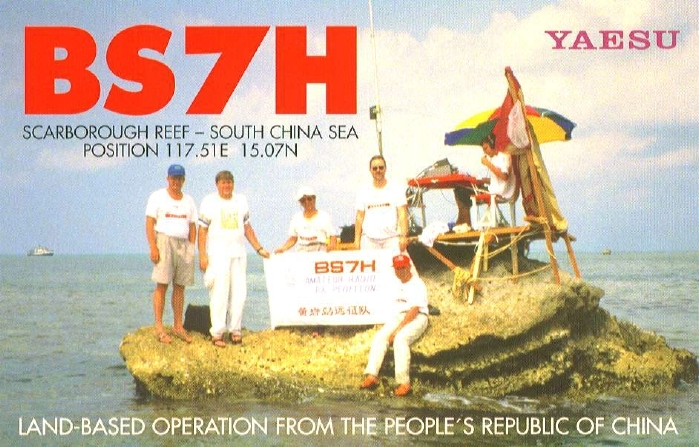 When the BS7H 1995 DXpedition hit the airwaves at 0928Z on 12 April, our first two QSOs were with JA1BK and DU9RG--two gentlemen who played critical roles in the success of the Scarborough Reef project. We then worked BY1PK, club station at the Chinese Radio Sports Association (CRSA) in Beijing. Thanks to PY7ZZ for providing this BS7H-BY1PK QSO snippet (182 kB WAV file)!